Download "Policy On Collection of Student Fees and Related Charges"
2 Fees and Other Related Charges 10. The broad categories of fees and charges that the University maintains are noted below. Tuition Fees 11. As part of the registration process, each student is required to sign a declaration acknowledging that they are personally liable to the University for payment of tuition and related fees. In the event of any fee-paying body not making payment on their behalf, each student undertakes to make payment of the full amount due to the University. This declaration states I acknowledge that I am personally liable to the University for the payment of tuition fees. In the event of any fee-paying authority or other person or body not making payment on my behalf, I undertake to make payment of the full amount due to the University. 12. Students must pay tuition fees on time. Details of instalment dates and other acceptable payment methods may be found at Students who intend their fees to be paid on their behalf must provide evidence that their fees will be paid in full or in part by a recognised fee-paying body such as a research council or other home/overseas body. Registry requires written confirmation of funding from a fee-paying body if tuition and related fees are being paid in part or in full on behalf of the student. Please provide this to the Registry as soon as you receive it. 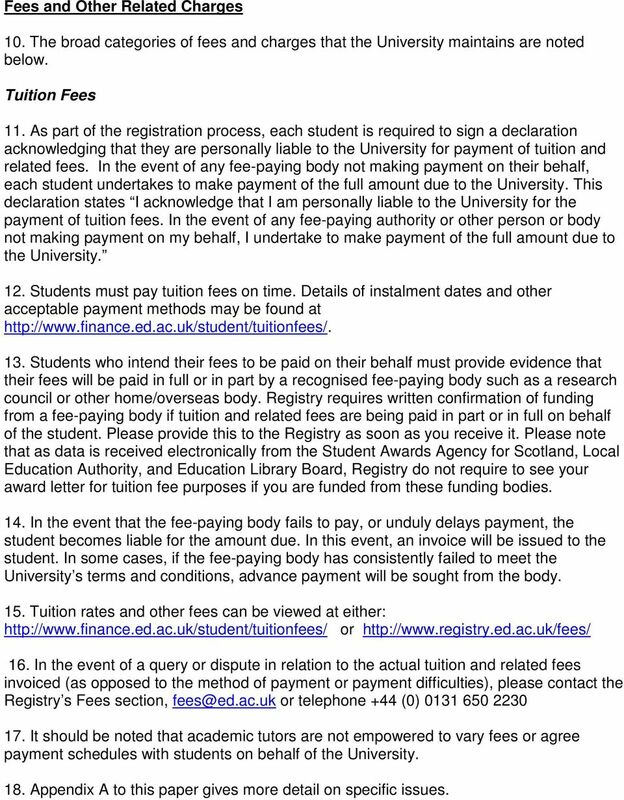 Please note that as data is received electronically from the Student Awards Agency for Scotland, Local Education Authority, and Education Library Board, Registry do not require to see your award letter for tuition fee purposes if you are funded from these funding bodies. 14. In the event that the fee-paying body fails to pay, or unduly delays payment, the student becomes liable for the amount due. In this event, an invoice will be issued to the student. In some cases, if the fee-paying body has consistently failed to meet the University s terms and conditions, advance payment will be sought from the body. 15. Tuition rates and other fees can be viewed at either: or In the event of a query or dispute in relation to the actual tuition and related fees invoiced (as opposed to the method of payment or payment difficulties), please contact the Registry s Fees section, or telephone +44 (0) It should be noted that academic tutors are not empowered to vary fees or agree payment schedules with students on behalf of the University. 18. Appendix A to this paper gives more detail on specific issues. 3 Accommodation 19. Accommodation offered by Accommodation Services is dependent on the student signing a lease for the period of accommodation, paying a deposit and agreeing in writing a payment plan to cover the accommodation fees. 20. The deposit will be used to off-set any accommodation arrears or other sums due to Accommodation Services for damages etc. 21. Accommodation fees can be paid up front as a full payment for the period of accommodation, paid semesterly in instalments depending on the length of lease (three instalments for a nine-month lease, or four instalments for a twelve-month lease). Students will be given an agreed payment plan prior to the signing of their lease, or shortly thereafter. 22. If a student is living in University-let accommodation, fees must be paid in accordance with the payment schedule agreed with Accommodation Services. 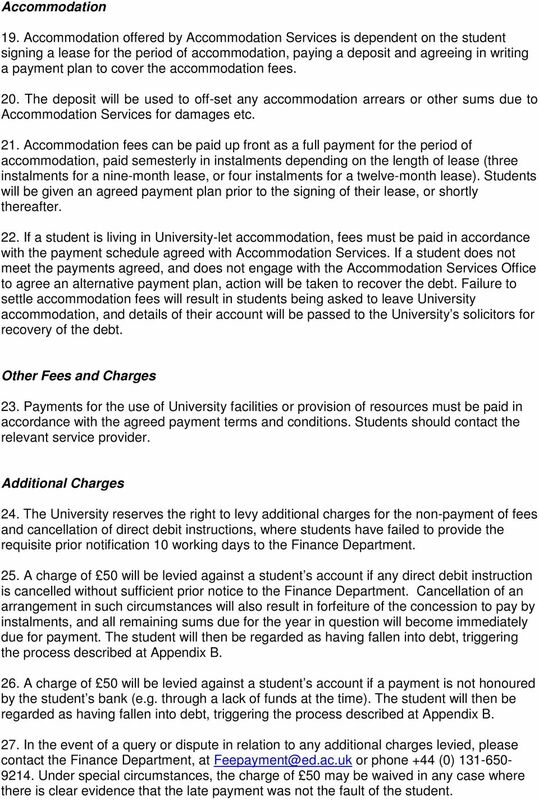 If a student does not meet the payments agreed, and does not engage with the Accommodation Services Office to agree an alternative payment plan, action will be taken to recover the debt. Failure to settle accommodation fees will result in students being asked to leave University accommodation, and details of their account will be passed to the University s solicitors for recovery of the debt. Other Fees and Charges 23. Payments for the use of University facilities or provision of resources must be paid in accordance with the agreed payment terms and conditions. Students should contact the relevant service provider. Additional Charges 24. The University reserves the right to levy additional charges for the non-payment of fees and cancellation of direct debit instructions, where students have failed to provide the requisite prior notification 10 working days to the Finance Department. 25. A charge of 50 will be levied against a student s account if any direct debit instruction is cancelled without sufficient prior notice to the Finance Department. Cancellation of an arrangement in such circumstances will also result in forfeiture of the concession to pay by instalments, and all remaining sums due for the year in question will become immediately due for payment. The student will then be regarded as having fallen into debt, triggering the process described at Appendix B. 26. A charge of 50 will be levied against a student s account if a payment is not honoured by the student s bank (e.g. through a lack of funds at the time). The student will then be regarded as having fallen into debt, triggering the process described at Appendix B. 27. In the event of a query or dispute in relation to any additional charges levied, please contact the Finance Department, at or phone +44 (0) Under special circumstances, the charge of 50 may be waived in any case where there is clear evidence that the late payment was not the fault of the student. 4 Debt Recovery Process 28. The debt recovery process will be triggered (a) where an invoice for fees or charges is not settled within thirty days of the date of issue, or (b) where a payment in accordance with an agreed instalment plan is not received. The debt recovery steps are detailed at Appendix B of this paper and will be followed where debt is identified. 29. Steps in relation to tuition fee and other debt include withdrawal of IT facilities, withdrawal from Programme of Study, and instigation of legal action to recover sums owed. 30. Steps in relation to accommodation debt include eviction from accommodation and instigation of legal action to recover sums owed. 5 Appendix A 1. Deferral or Interruption from a Programme of Study Where a postgraduate student has paid fees for the relevant academic session and subsequently arranges to interrupt their studies in excess of three months, any overpayment will be refunded. When the student returns to the University they will be liable for the fee at the current tuition fee level. 2. Early Withdrawal from Accommodation or a Programme of Study In the event of a student withdrawing from a programme of study, the date of withdrawal will be the date either from which the student notifies their Director of Studies of their intention to withdraw, or the date from which the student advises Registry either by or in writing of their decision to withdraw. For students who withdraw from a programme of study, an assessment and, if appropriate, adjustment in the fees due will be made. This may result in a revised invoice requiring payment, or a refund. For further details, please refer to the relevant table of fees at: If a student leaves University accommodation early, the sum for which he/she remains liable is set out in the Terms and Conditions of Residence for University Accommodation. In the event of non-payment, action will be taken to recover all amounts due to the University. 3. Annual Registration Students will NOT be allowed to fully register for the next year of their programme whilst they are in debt to the University. Students who are not fully registered will not be permitted to pay tuition fees in instalments, and details of non-fully registered students will be passed to College and School offices for attention. 4. Final Year Students Students in debt to the University will NOT be allowed to graduate. 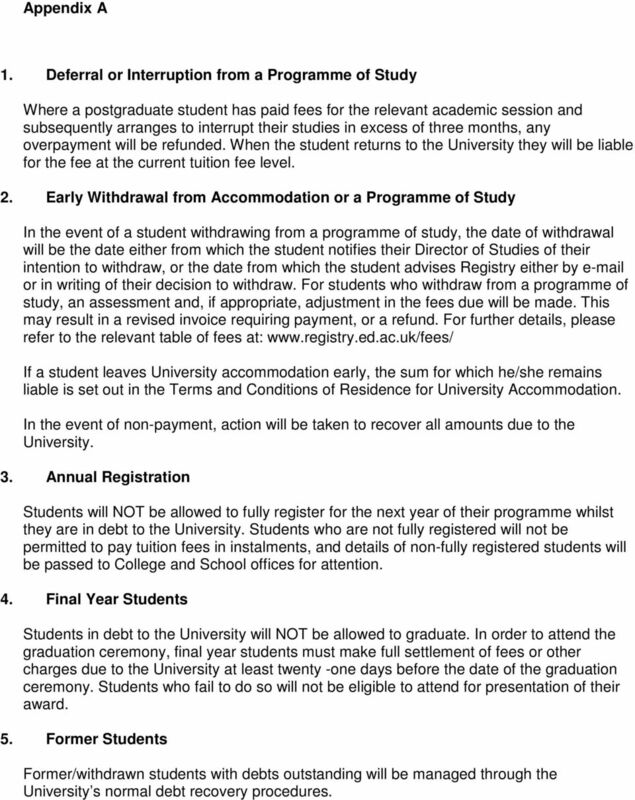 In order to attend the graduation ceremony, final year students must make full settlement of fees or other charges due to the University at least twenty -one days before the date of the graduation ceremony. Students who fail to do so will not be eligible to attend for presentation of their award. 5. Former Students Former/withdrawn students with debts outstanding will be managed through the University s normal debt recovery procedures. 6 Appendix B Collection Processes to be followed for Arrears Late payment tuition fees Note: The Finance Department addresses all s to students official University addresses. It is the student s responsibility to check this account on a regular basis. Day Activity 1 For Debt Recovery purposes, Day 1 is the day following the date on which a payment is due. For those due to settle an invoice, standard terms are 30 days. In that case, Day 1 will be the 31 st day following the invoice date. For those paying by instalments, Day 1 will be the day following the date on which an instalment was due for collection. 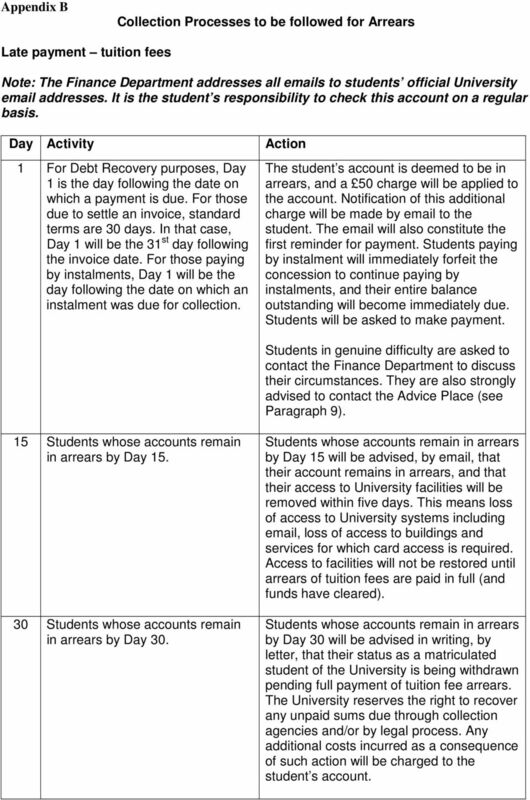 Action The student s account is deemed to be in arrears, and a 50 charge will be applied to the account. Notification of this additional charge will be made by to the student. The will also constitute the first reminder for payment. Students paying by instalment will immediately forfeit the concession to continue paying by instalments, and their entire balance outstanding will become immediately due. Students will be asked to make payment. 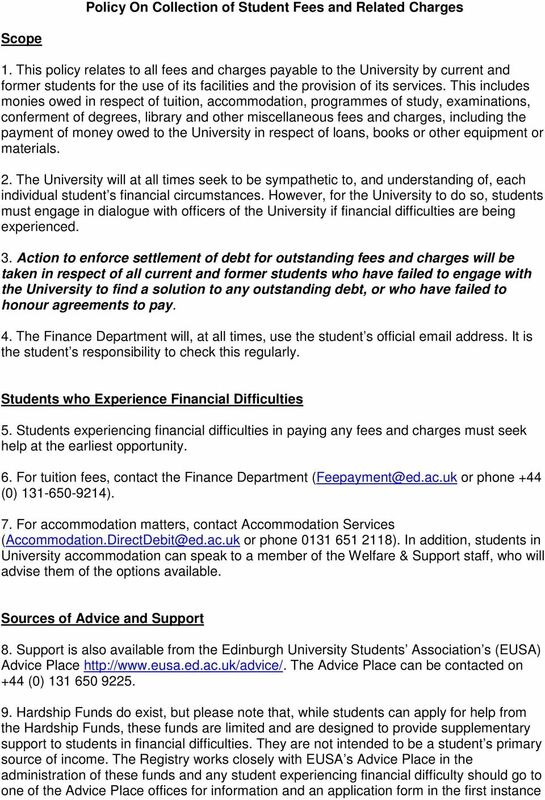 Students in genuine difficulty are asked to contact the Finance Department to discuss their circumstances. They are also strongly advised to contact the Advice Place (see Paragraph 9). 15 Students whose accounts remain in arrears by Day Students whose accounts remain in arrears by Day 30. Students whose accounts remain in arrears by Day 15 will be advised, by , that their account remains in arrears, and that their access to University facilities will be removed within five days. This means loss of access to University systems including , loss of access to buildings and services for which card access is required. Access to facilities will not be restored until arrears of tuition fees are paid in full (and funds have cleared). Students whose accounts remain in arrears by Day 30 will be advised in writing, by letter, that their status as a matriculated student of the University is being withdrawn pending full payment of tuition fee arrears. The University reserves the right to recover any unpaid sums due through collection agencies and/or by legal process. Any additional costs incurred as a consequence of such action will be charged to the student s account. 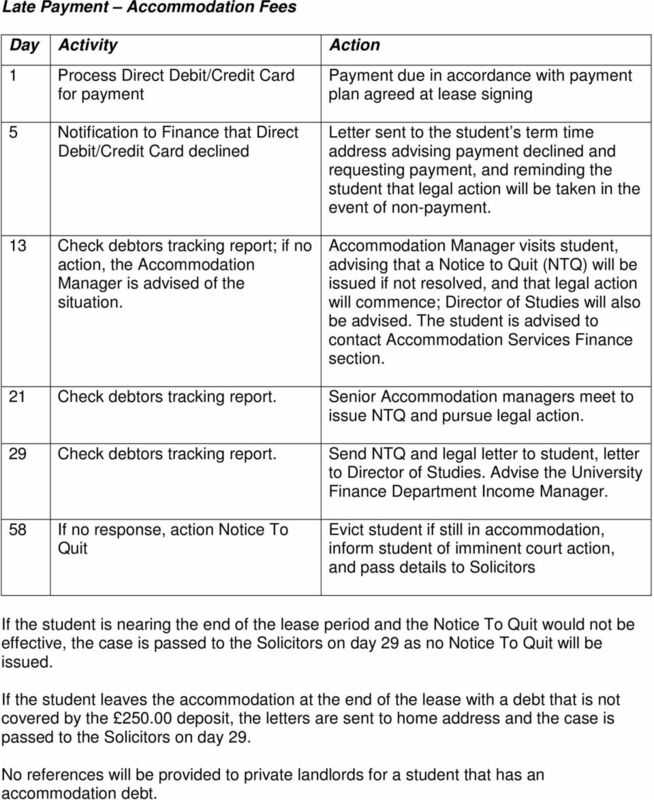 7 Late Payment Accommodation Fees Day Activity Action 1 Process Direct Debit/Credit Card for payment 5 Notification to Finance that Direct Debit/Credit Card declined 13 Check debtors tracking report; if no action, the Accommodation Manager is advised of the situation. Payment due in accordance with payment plan agreed at lease signing Letter sent to the student s term time address advising payment declined and requesting payment, and reminding the student that legal action will be taken in the event of non-payment. Accommodation Manager visits student, advising that a Notice to Quit (NTQ) will be issued if not resolved, and that legal action will commence; Director of Studies will also be advised. The student is advised to contact Accommodation Services Finance section. 21 Check debtors tracking report. Senior Accommodation managers meet to issue NTQ and pursue legal action. 29 Check debtors tracking report. Send NTQ and legal letter to student, letter to Director of Studies. Advise the University Finance Department Income Manager. 58 If no response, action Notice To Quit Evict student if still in accommodation, inform student of imminent court action, and pass details to Solicitors If the student is nearing the end of the lease period and the Notice To Quit would not be effective, the case is passed to the Solicitors on day 29 as no Notice To Quit will be issued. If the student leaves the accommodation at the end of the lease with a debt that is not covered by the deposit, the letters are sent to home address and the case is passed to the Solicitors on day 29. No references will be provided to private landlords for a student that has an accommodation debt. PPI Claim Form. Easy steps to claim back your money. 1. Fill in all the required details and questionnaire.